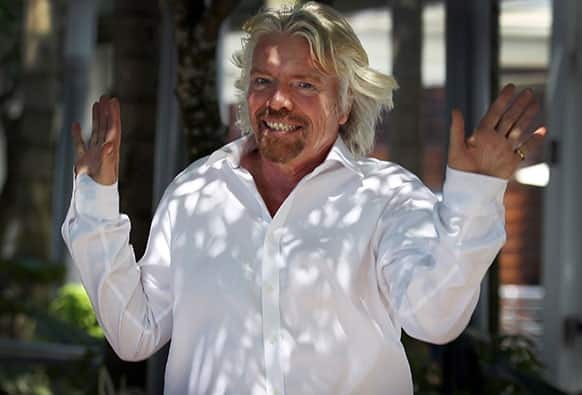 Richard Branson, founder and chairman of the Virgin Group, gestures upon arrival for a press conference in Singapore on the sidelines of the Carbon War Room conference held in the city-state. 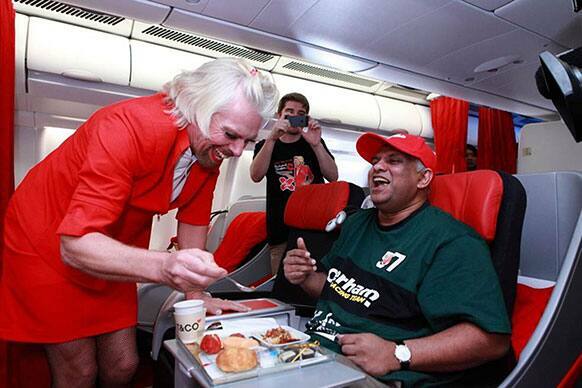 AirAsia chief Tony Fernandes, right, is served by British business magnate Richard Branson who is dressed as a female flight attendant, while flying from Perth, Australia to Kuala Lumpur, Malaysia. 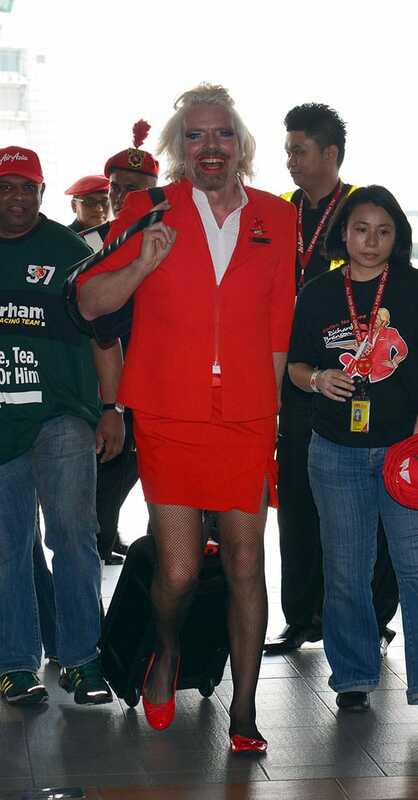 British entrepreneur Richard Branson arrives at a low cost carrier terminal dressed up as an AirAsia stewardess from a flight from Australia to Malaysia. 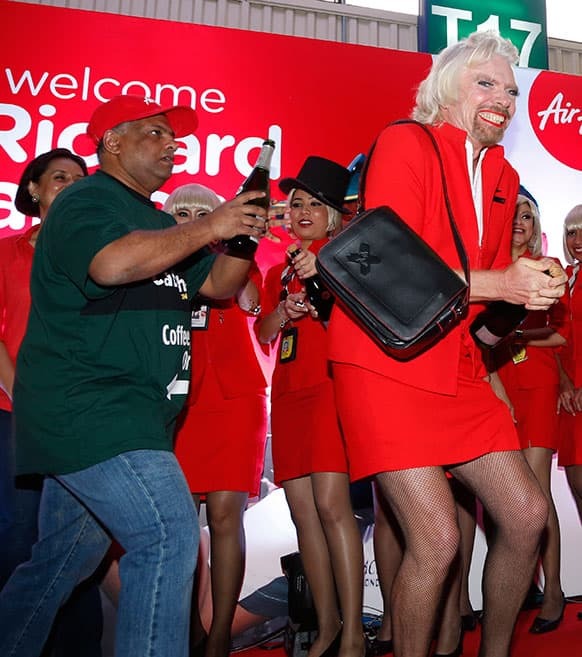 British entrepreneur Richard Branson, left, poses with AirAsia`s Chief Executive Tony Fernandes while dressed up as an AirAsia flight attendant at a low cost carrier terminal in Malaysia. British business magnate Richard Branson, right, dressed up as an AirAsia flight attendant, and AirAsia`s Chief Executive Tony Fernandes prepare to spray champagne during an AirAsia promotional event after Branson arrived at the low cost carrier terminal in Kuala Lumpur, Malaysia. 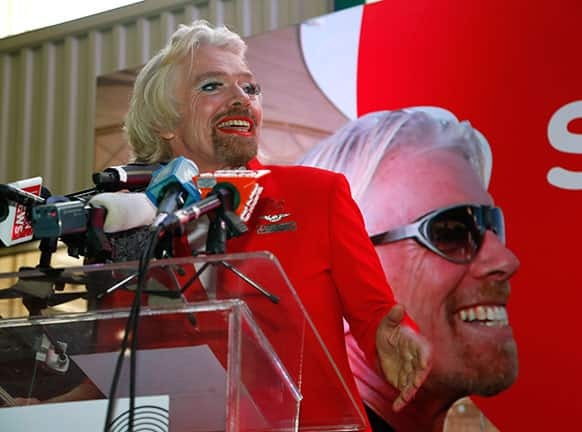 British entrepreneur Richard Branson speaks during a press conference while dressed up as an AirAsia flight attendant at a low cost carrier terminal in Malaysia. British entrepreneur Richard Branson, left, poses with AirAsia`s Chief Executive Tony Fernandes while dressed as an AirAsia flight attendant at a low cost carrier terminal in Malaysia.